Chris and I got up early today so we could go to Ikea to get our furniture!!! We had to borrow my dad's SUV because my VW Beetle would not haul everything we got! We bought the table and chairs I posted a few days ago, and the desk also. I'll have to hold off on that amazing office chair, but soon enough! Chris has been hard at work putting everything together, and once it's all set up I'll take photos! 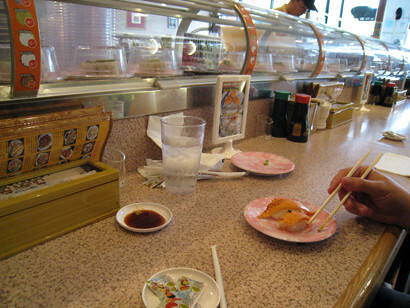 We stopped for lunch at our favorite place in the world, Sushi Station! I'm not really into sushi being that I'm the world's pickiest eater, but I love going here. The food comes around on a conveyor belt! It's quirky and fun and always busy, but we were lucky today and got there right when it opened so we didn't have to wait. I brought my camera along to snap some pics of the place, but I got weird and embarrassed about taking photos there. I got a couple though! We're going to hang out for a while and then we're off for his cousin's birthday party... Hope you're having a good day! 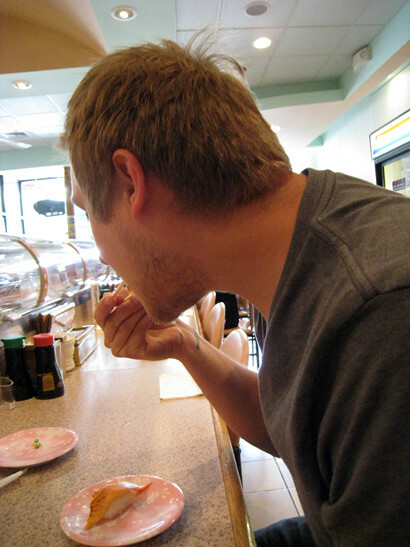 I tried sushi for the first time the other day. I got yelled at for cutting it with a knife. I guess thats not proper etiquette? But that place looks like fun!! did you get meatballs from ikea? they are the best! ah so cute! i've been wanting sushi.